Just a few kilometres from Gowrie Farm is Brookdale Health Hydro, where one can retreat to the tranquility of a haven bordered by forest and farmland with a meandering stream. At Brookdale Health Hydro, the focus is on providing an escape from the stresses of everyday life. They offer a quiet place where physical health and mental wellbeing can be restored to their balance. They focus on re-establishing a healthy lifestyle and restoring mental composure where stressful living has taken its toll. Their special environment creates an incomparable sense of tranquility conducive to deep relaxation and instilling peace of mind. 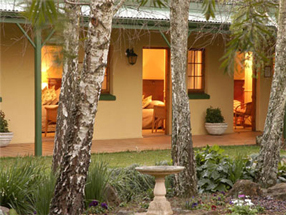 Located a few kilometres from Gowrie Farm is Fordoun Spa, Hotel and Restaurant; an oasis of relaxation and sensory bliss. 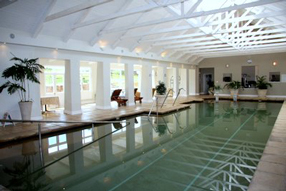 Fordoun Spa boasts a team of expert personal trainers, masseurs, nutritionists and beauticians, and features internationally proven healthcare and beauty treatments, including the rasul, (a Turkish steam and clay treatment room), a saline Floatation pool, heated swimming pool, a gymnasium, sauna, steam room, vichy shower, hydrotherapy room, and a couples’ treatment suite with hydrotherapy bath. 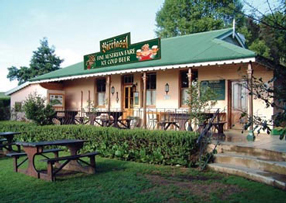 A quaint Austrian Tavern just down the road from Gowrie Farm, where you and your friends and family can sample a selection of the Nottingham Road draught brews, or you can carouse in true European-style with their extensive range of wine and traditional schnapps. Enjoy traditional, hand-made German sausages or their famous eisbein, homemade soups and other local fare. Sit on the veranda or the lawns overlooking the scenic rolling hills, or get cosy inside the warm wood-panelled restaurant and pub. Bring the family. Relax and enjoy your meal while the children entertain themselves in our extensive playground in safe quiet surroundings. 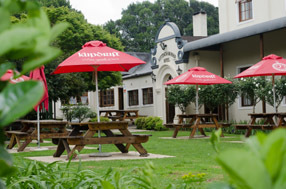 Caversham Mill Restaurant is a landmark in the area. It is a first class, well-priced establishment offering modern comfort food, individually prepared and served in an idyllic Midlands setting. The menu is Ã¡ la Carte, and caters for all tastes. Breakfast, lunches and intimate dinners are prepared using fresh, locally produced ingredients. Where possible, only organically farmed produce is used. In this way, the restaurant supports its surrounding communities. Every six months the menu is changed to provide a stimulating variation of attractive, tasty new dishes. Enjoy a glass of wine or some other aperitif in the bar before dining. Sit in the restaurant, on the deck, or on the lawns overlooking the tumbling waterfall and the wheel of the old mill, and soak in the historic ambience! Fordoun’s Skye Restaurant offers a diverse menu that combines wholesome dishes with more indulgent fare in an ever-changing showcase of the finest and freshest ingredients of the season. Fully licensed, the Skye Restaurant will offer a selection of wines specially chosen to combine the appeal of old favourites with unheralded new discoveries. Open to guests and the public seven days a week. Booking is essential. Notties Pub is affectionately known to locals and many past travelers and is renowned for its festive atmosphere, fine fare and warm hospitality and has really stood the test of time with the original wooden pub. They offer A la Carte dining & for a more relaxed atmosphere you can unwind in the legendary pub and enjoy a sumptuous traditional pub meal. Our dining facilities include a warm, elegant dining room where discreet tables just for two are available for those wanting to enjoy a quiet romantic dinner, or guests can dine on the terrace overlooking beautiful trout dams, lush farmlands and undulating hills. The Tudor Rose coffee shop offers a delightful range of cakes and sweet treats, and is well-known for afternoon cream scones. 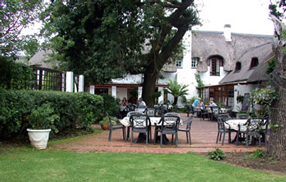 Restaurant Terrace Dine al fresco on our tranquil terrace under the spread of old oak trees. The Boars Head is a warm, cosy pub where traditional ‘pub grub’ is served in a friendly and informal atmosphere, with a crackling fire adding to the ambience in winter. 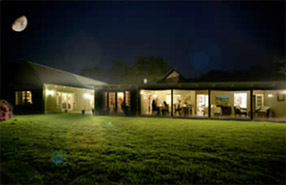 There is also a large social area where a formal or informal function can be enjoyed. 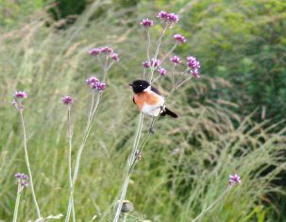 Over 180 types of birds have been identified on Gowrie Farm. Any person wishing to obtain information about the birds at Gowrie Farm may contact Bridget Robinson on +27 33 266 6763. Bridget has been instrumental in identifying birds at Gowrie Farm and has compiled a list of birds spotted at Gowrie Farm. Click here for printable version of the Bird List. Nottingham Road offers wonderful cycling for the keen cyclist with quiet roads out in the Kamberg, Loteni and Dargle valleys. Maps are available from the Tourist Office at Gowrie Village. 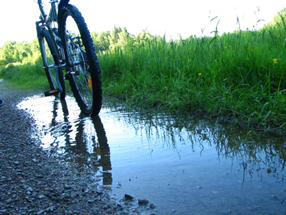 There are also a number of mountain bike routes in the foothills of the Drakensberg. 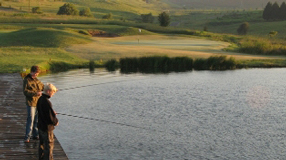 Situated on Gowrie Farm are four magnificent trout dams, all well stocked and managed by Wild-Fly. Use of these dams is restricted to Gowrie Farm home owners, a select group of fishing members and guests staying at Gowrie Lodge. For expert advice on fishing in the area, or on fishing in general, contact Gareth George of Wild-Fly directly on +27 33 266 6981, or visit the website at www.wildfly.co.za.